Let me know if you decide to change the title. I just noticed that in the UK it is easier for you to get Ceratophyllum submersum (Soft Hornwort) as opposed to the more common Ceratophyllum demersum. Very delicate. Why do I bring this up? Because submersum is a great stem plant that does no shed like the demersum. It is the stem plant in this tank. It has no roots so let it float free or anchor with a weight. I love the look and the Betta love resting in and wriggling through it. It is not as easy to find in the US. I have a 10-gallon tank's worth coming when the weather is better. That plant is very pretty. I will look this plant up and see if I can get some to try. 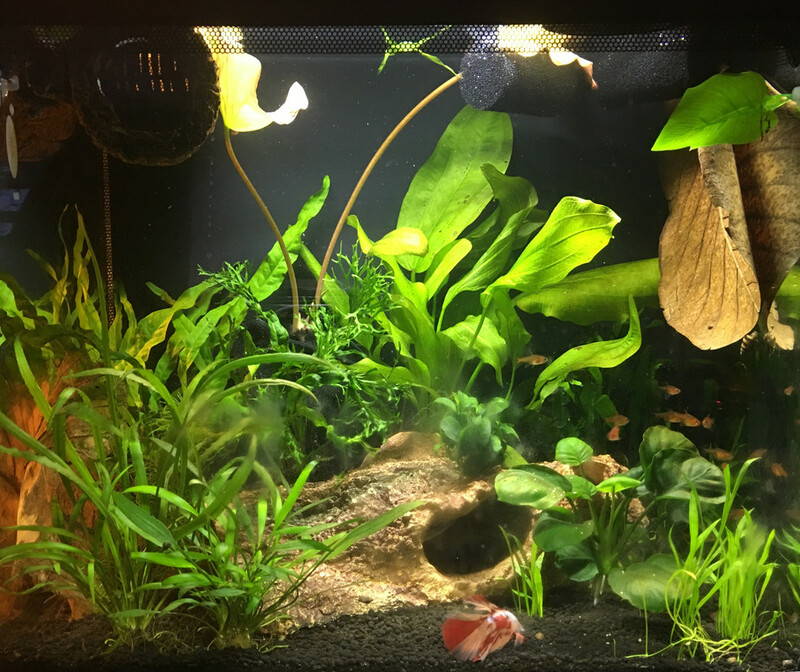 I definitely want more plant surface cover for Kham - which is why I got the dwarf lotus (and the snails came too) but the speed it is growing is rather intimidating. It has 3 leaves grown in 10 days and the 4th grew up from the base by nearly a foot in 24 hrs yesterday. It is going to take constant hacking to keep under control. No sign of Assassin at all yesterday. I hope this means s/he is patrolling and munching and getting snail numbers down. 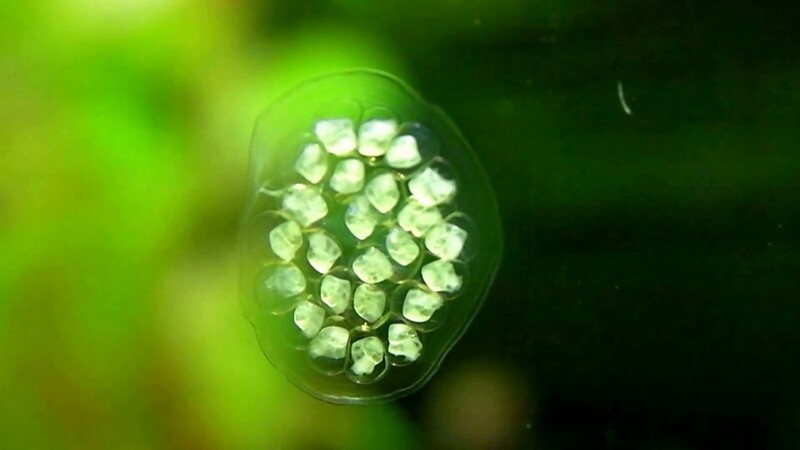 I spotted some snail eggs on the glass yesterday, and came back 2 hrs late to find the had disappeared/hatched before I could remove them myself. No wonder they get into tanks unnoticed. The eggs were smaller than grains of salt! I have decided to view the babies as Assassin Food rather than me being too late to get them out. Very pretty, loving all the green! This pic came from another website, but this is exactly what they looked like. The whole batch was only about half a centimetre across. Amazed I even saw it. Last edited by bluesamphire; 01-20-2019 at 04:26 AM. Beautiful tank, and such a oddly patterned betta! Following a bit of sexual tension and aggression in the 15g I needed a rapid rehome for Big Red the overly frisky cherry barb who was causing all the trouble. So I moved him into Kham’s tank yesterday. He is still restlessly glass surfing but he has had something to eat, and is totally ignoring all his new tank mates. Which is good. Hopefully he will calm down a bit without his cherry barb harem to impress. I have also received and installed 6 ember tetras today. Bad timing in view of Big Red’s meltdown, but the timing clash was unavoidable. Anyway, they seem to have settled in very well already. Shoaling, exploring, eating. The second half of the shoal will be along in a week or two. And Kham and Big Red are ignoring everyone else. No ammonia or nitrite spikes, so the beneficial bacteria are up to the job. Can you spot a colour theme? Haha! Oh, and I have taken 3 lily leaves out so far. Eventually will be happy with surface leaves, but am letting it develop slowly. There are plenty of nutrients in the new substrate, and I am enjoying the mid level leaves at the mo. Not sure the lily agrees with me though. It sent a leaf up the height of the tank in 36 hours, so it will need almost daily pruning. Last edited by bluesamphire; 01-24-2019 at 09:59 AM. Tank looks great. Nice aquascaping. Hmmm....guess the theme.........orange, green, Halloween? Right. So. Time for an update. No ammonia or nitrite spikes from adding Big Red and the half shoal of ember tetras, so i added the other half today. We are now up to 12, which various sites have said is a comfortable number for them. 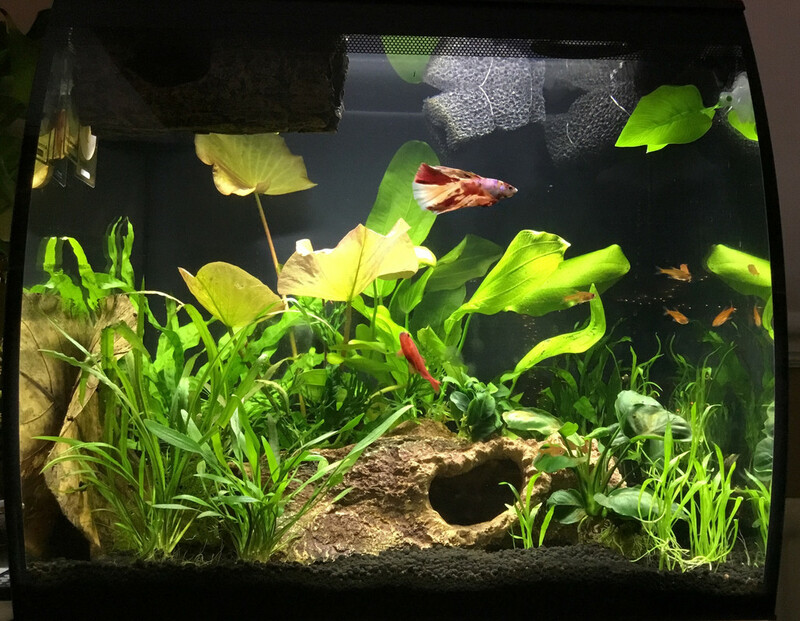 I’m now looking at the tank and thinking it is too busy and crowded with plants (seen some impressive plant growth recently). And 12 embers make it look crowded with fish - to me. But it isn’t my tank, is it? It belongs to Kham and the tetras now. And they all seem to be loving the plant density. And the embers are definitely enjoying the safety-in-numbers of being in a bigger fleet. The tank is under stocked according to its huge filter capacity, and stocking calculators. But it has higher stock levels than I think is visually ideal. Maybe it is Big Red’s presence that does it. The assassin has been busy. Can you see him in the pic? Climbing the R wall to the indian almond leaf. He has grown. I keep seeing empty pond snail shells on the substrate. So he is eating well. I have frozen bloodworms ready for when he wipes out the pond snail population. The pic shows quite how much growth has gone on. I’ve been adding a little liquid CO2, and it really gave everything a kick up the backside. No melting on anything, which is stunning. Sorry about the blurriness on the front wall. That is algae. It appeared this last week. I’m torn between leaving it for the snails, or wiping it away, for my visual pleasure. Will decide at tomorrow’s WC. The indian almond leaves are helping soften the water beautifully. I’ve had hard water in the tanks since moving here 10 years ago. 2 IAL leaves have dropped this 57litre from 7.4 to 6.6 on the pH Alert. That is a really handy gauge for using them on Valentine’s 22 litre and Tagawa’s 70 litre. Oh, and Big red is much calmer now he is away from his harem. I doubt if he is happy, all on his shoaless lonesome, but the rest of the shoal (still in Tagawa’s 70litre) are friendlier and flirtier and definitely happier without him. He hasn’t bothered the embers or Kham at all, despite them being orange-red. Ratvan and Zeroblaze like this. Last edited by bluesamphire; 02-03-2019 at 11:40 AM.